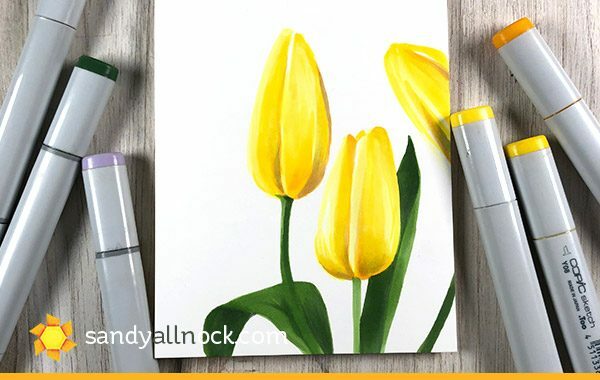 For those who’ve been waiting for another advanced Copic class…today’s your day! 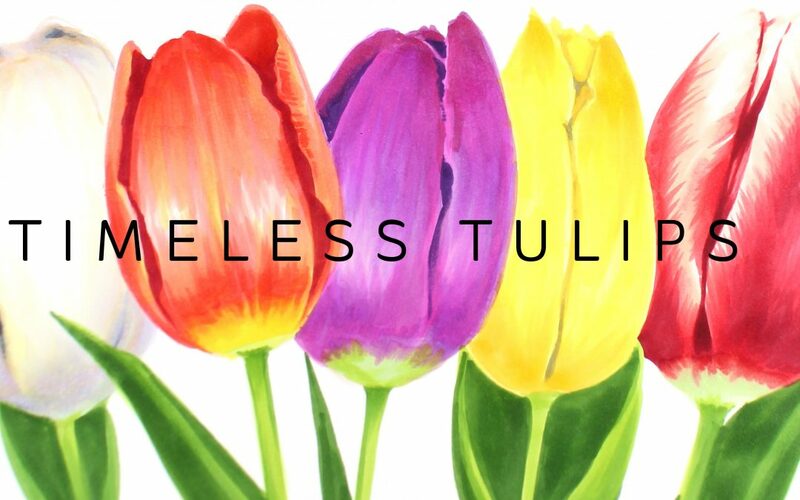 The class is HERE if you’re inclined to learn to draw your own tulips this spring! It’s on a little launch sale through the end of April. Watch the preview video below or click HERE to see it on YT. 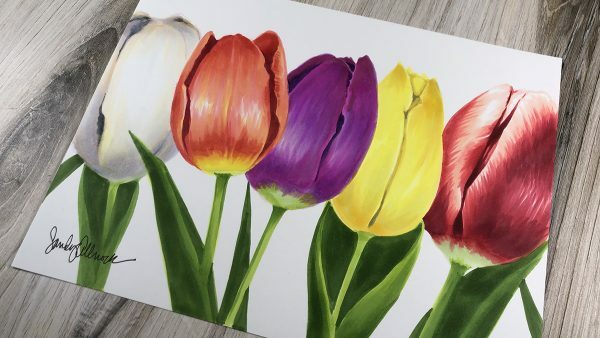 The class teaches the five tulips in one big image – but once you master that, you can dive in and make your own hand-drawn cards with no stamps! You’ll be amazing! 🙂 Class is HERE. By the way….thanks to all my students for taking classes and working hard to grow. I am SO grateful to have people dedicated to learning their art and gaining new skills! It’s what keeps me going! I thought I’d try a little something new. Bear with me while I explain! In my experimenting with these Wednesday posts…I’m finding that YT viewers really don’t come over here to my blog at all. 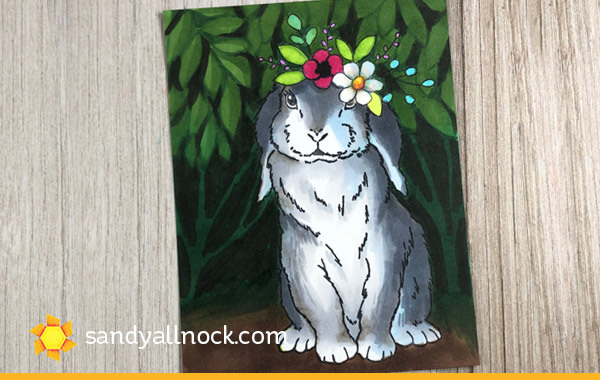 (LOL) I’d like to test out a little different approach to some of these Weds videos: creating a card blog post for card people….and let the card inspire a speed drawing or painting fine art piece on YT (or vice versa! ), which would also let people know there’s a card post over here. It may turn into a convoluted way to go about things, I’m not sure. But this gives me the heart-happiness of creating a fine art piece without the pressure of ‘teaching’ it (no voiceover), and the craft-happiness of sharing some cards with some favorite stamps. If you’re a YT-only viewer, leave a shoutout in the comments here to let me know if you followed over here. Just so I know if giving you a card peek was worth making a related fine art video! 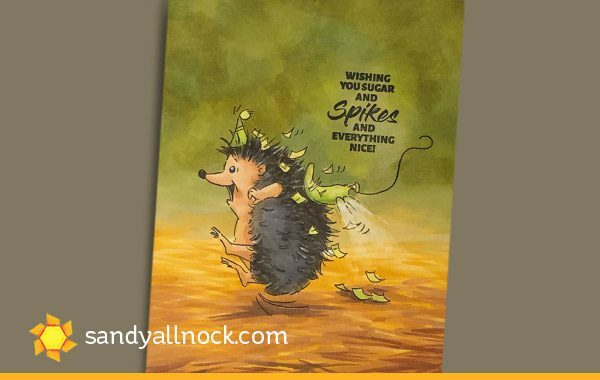 The video for today is a sweet little hedgehog with a spring crown of flowers….she’s ready for Easter Sunday church, don’t you think? It’s drawn on Desert Storm cardstock with Copics, and accents added in colored pencils. 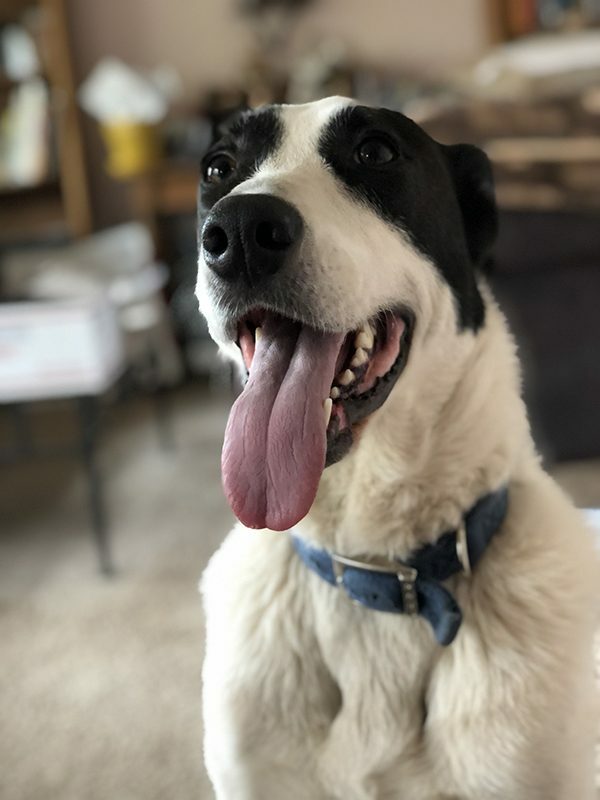 Watch the video below or click HERE to see it on YouTube. 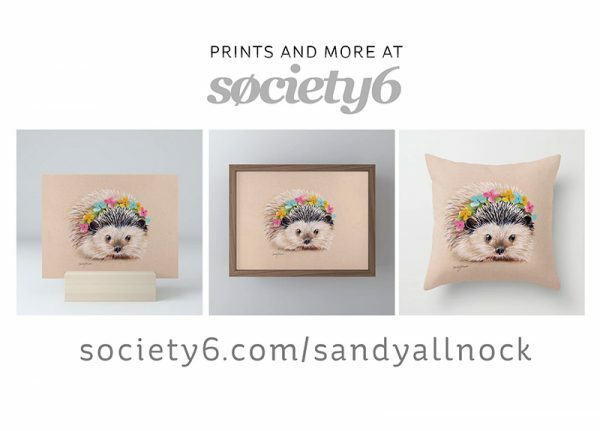 If you’re a hedgie fan….good news: you can get a print or pillow with this piece. I ordered one of the tiny mini prints on the little stand, that is just so cute! 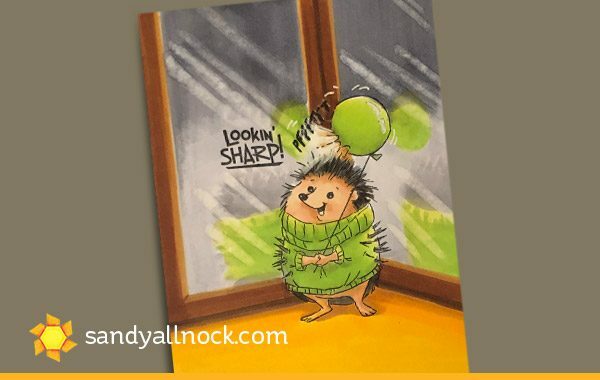 I also wanted to share a little hedgehog coloring with Art Impressions recent Hedgehogs stamp set – I gave them each a fun setting, of course, because – well why not? This lil guy is lookin sharp…at himself in a dressing room! OOPS! Poor hedgie popped his biirthday balloon! Napping in the desert…only a hedgie would consider a cactus a pillow! 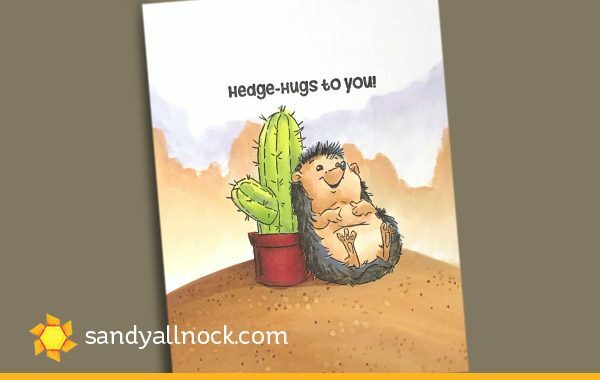 I’ve collected a bunch of my videos with hedgies in them….and in the supply list a ton of hedgie stamps! Collectors: I apologize to your wallet! ha! Hope you enjoyed some of these older videos! 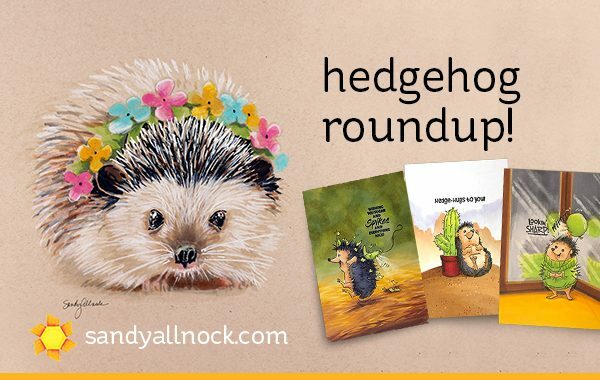 Hedgehog fans: I collected a bunch of different hedgehog stamps – some are in videos above, some just look like fun! All my friends will be fighting over this card. LOL! 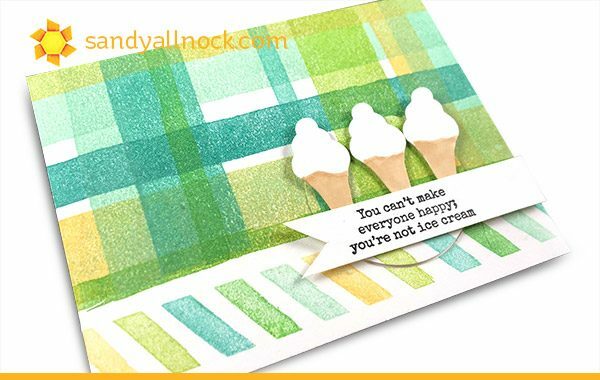 When I saw Ellen’s new stamp set by Julie, I immediately thought of seeing the top of an ice cream cone rather than a cup of coffee or tea. 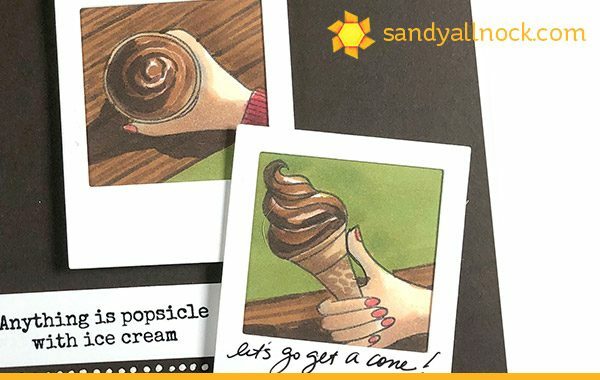 All the sneak peeks I’ve seen this week have been beverages – but man, I’m goin’ for ice cream – I don’t drink coffee so that’s never my first idea! Ha! 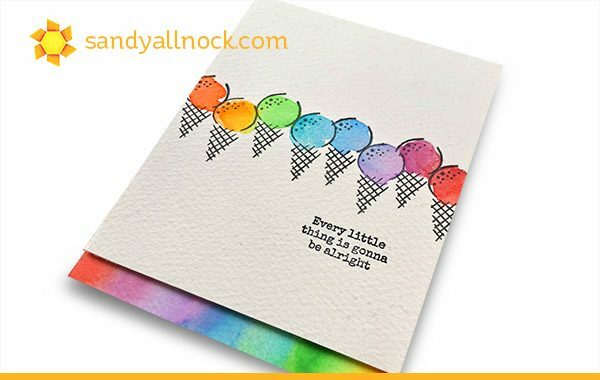 By itself, the “overhead” pic may not look much like an ice cream cone, but man, when you put it with sentiments and a side view – I think it works, don’t you? Now to figure out which friend gets this card! Are you thinking I am obsessed with ice cream by now? 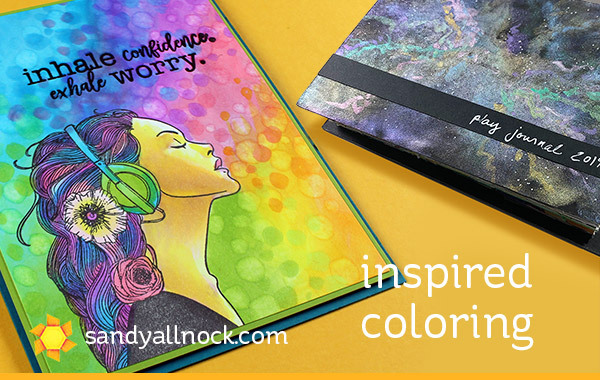 This is with the doodles set…..
WHEW! We made it! Those joining in with the #playjournal challenge – I’m so proud of you for stepping out! Winners of the 12 prize boxes are listed later in this post. I discovered during my play time last month that sometimes…just relaxing and not thinking about anything is the most relaxing way to color….so I did. 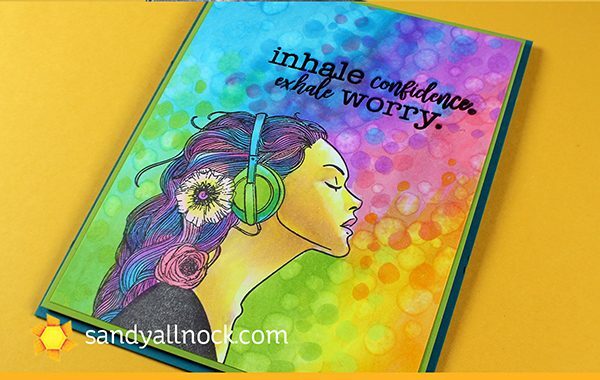 Inhale confidence…exhale worry! 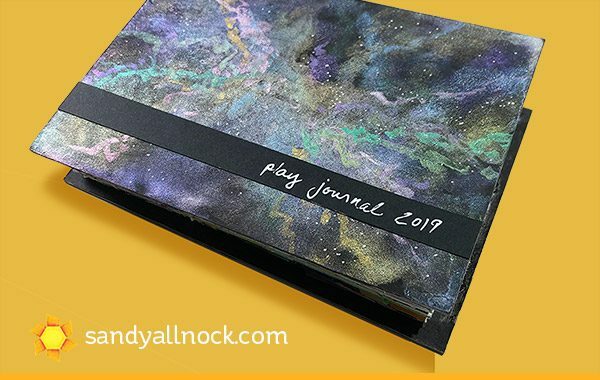 If you’d like to see stills of the whole playjournal, click HERE – lots of links to the stamps and mediums used, and a little description of what was done on each panel if you need ideas to try! Congrats to all these awesome peeps….click through to see all the fun things they made all month! Winners: email me using my contact form and send your address! Wheeeee! Welcome to my stop on the Topflight Stamps hop! They’re a company that shares some of the stamps made all over the world with people like me here in the US…brands we don’t normally see! They’re celebrating their birthday, and sent me a couple stamp sets I wanna show you – Meerkats﻿ andFarm animals﻿ by Katzelkraft! For my cards I’ve got some uber-silly fun with Katzelkraft stamps, all of which I’m auctioning off for charity! If you always wanted one of my crazy cards, stay tuned here on the blog for more auctions all year! 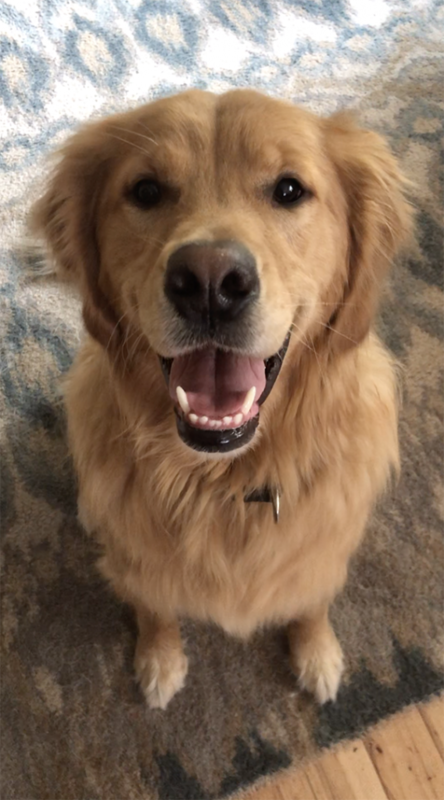 But first – a vlog with pups doing silly things. Be sure to scroll to the end to hop to the next stop so you can qualify for PRIZES! 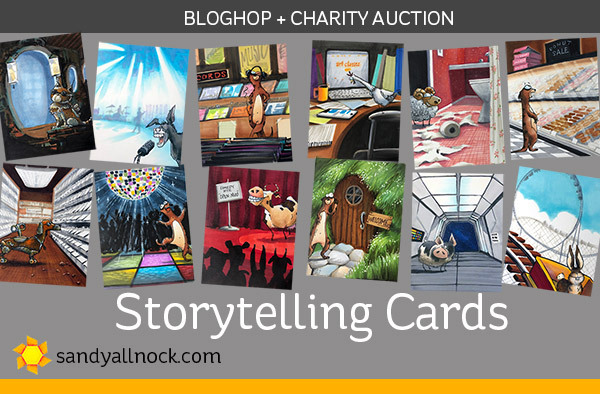 Each card below has a funny little backstory…PLUS links to the auction page for each card! 100% of proceeds will be donated to help flood victims in Nebraska and surrounding areas. But we can help. 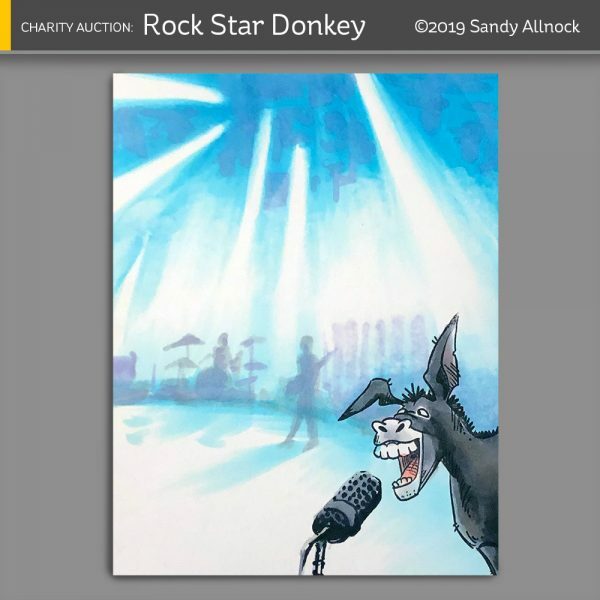 Bid high! BIDDING IS OPEN THROUGH MARCH 31 at midnight pacific time. 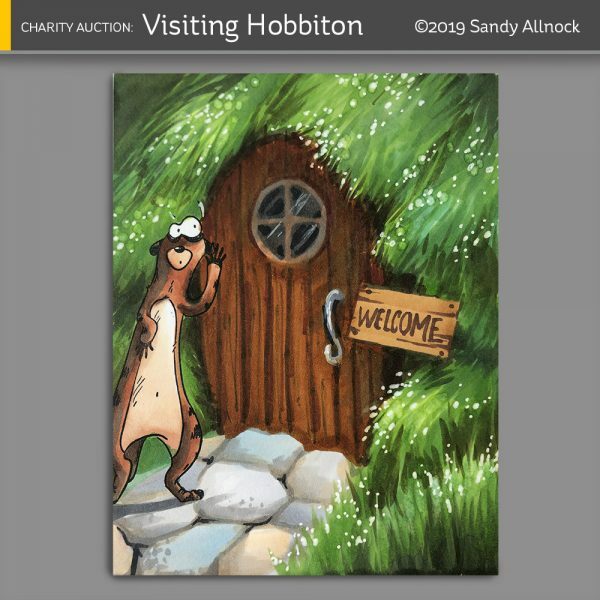 Meerkats love to go on holiday to Hobbiton in Matamata NZ, because the LOTR is super popular in meerkat mobs. Yes, they’re called mobs. 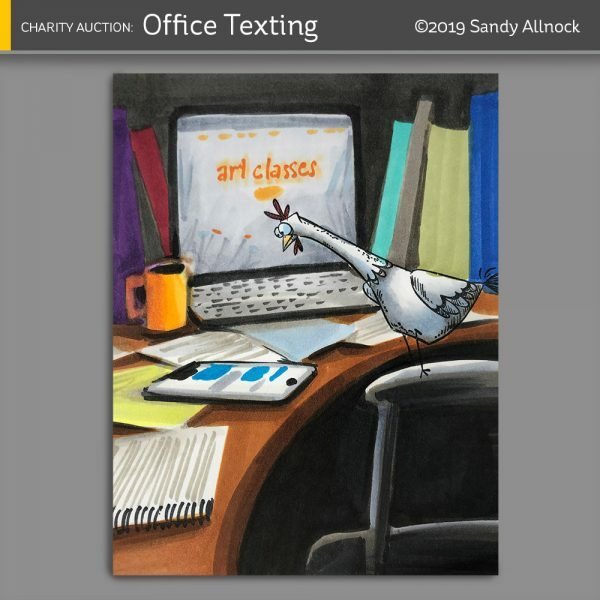 BID HERE. Robot Dog, called “Tinker” by his friends, seeks a few replacement parts in the local hardware store under flickering flourescent light. 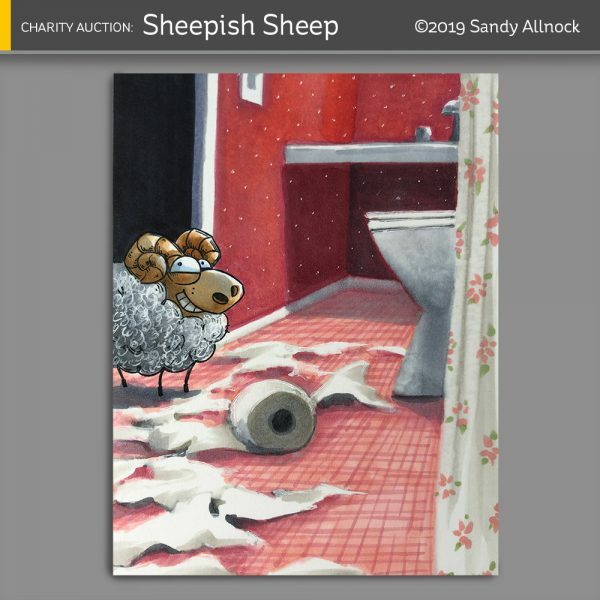 BID HERE. You thought your cat trashed the toilet paper roll – but this time, the cat’s innocent….don’t get mad. He’s cuddly. 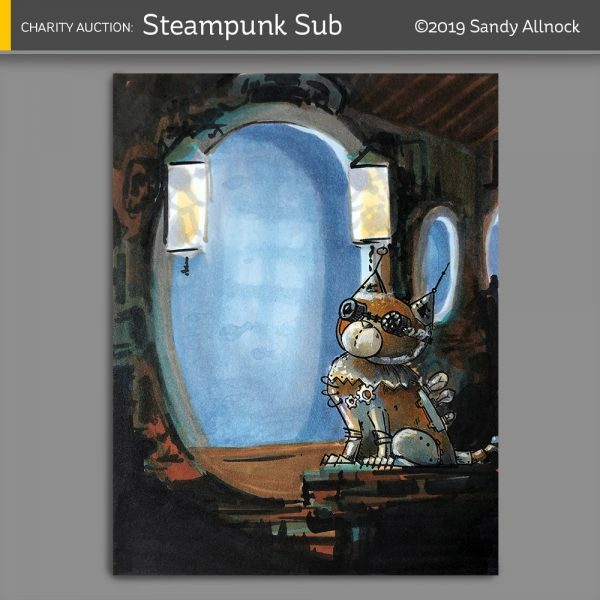 BID HERE. Doug “Hoofin’ It” Blackstone finally made it out of his hotel room to the concert venue. No one was sure if he’d ever come out – he doesn’t have cable at home, and he got hooked on HeeHaw reruns. BID HERE. Captain Nemo had his cat along when he went 20,000 leagues under the sea. He was a pretty useless feline, just watching the fish out the submarine’s window day after day. BID HERE. On Old MacDonald’s Farm, the animals spend the late evening entertaining each other with cowmediums – they stay up even if it’s pasture bed time! BID HERE. 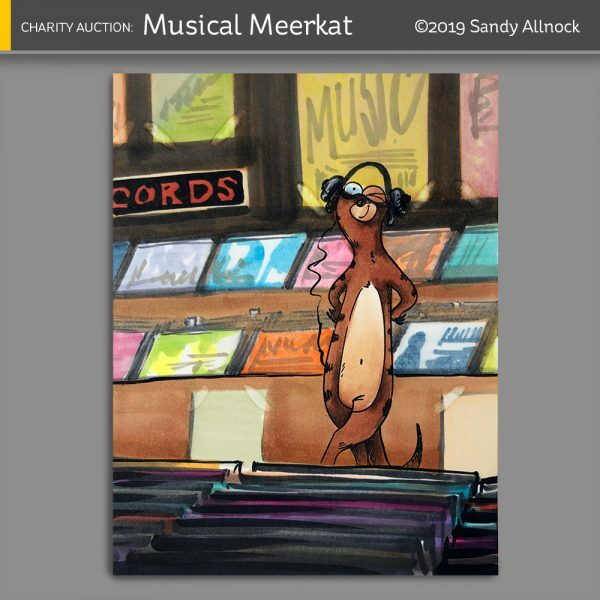 Tony is a collector of old jazz albums, and hangs out in local record shops sampling the kool kats – like Benny Goodkat, Jellyroll Meerkat, and the Glenn Meer Orkatstra. BID HERE. Never hire a chicken foor an office job. They may be able to cross the road to get to the building, but they just can’t stop texting once they arrive. BID HERE. Animals are just like us. 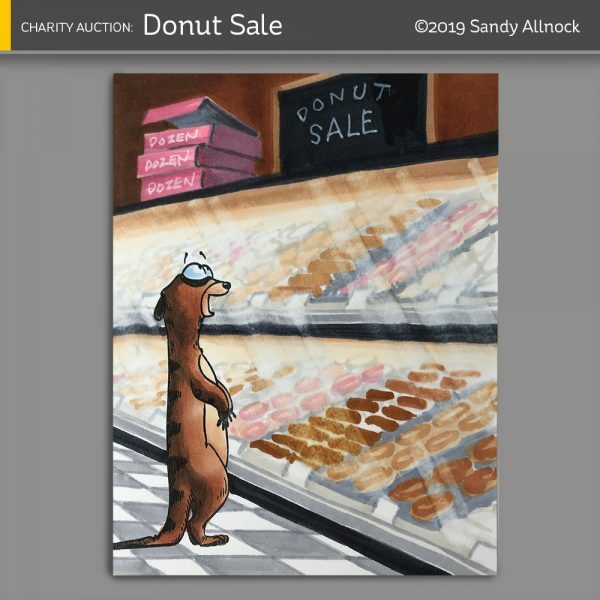 They love a good sale on sweet pastries, too! He’s going to need a few dozen to take back to the rest of the mob, though. BID HERE. Captain Link Hogthrob is reprogramming the computer panel on the porkdeck. (What? 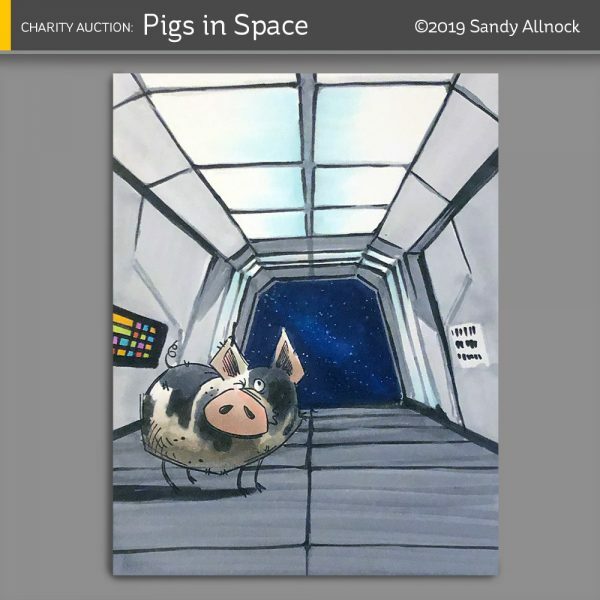 You don’t remember Pigs in Space??) BID HERE. 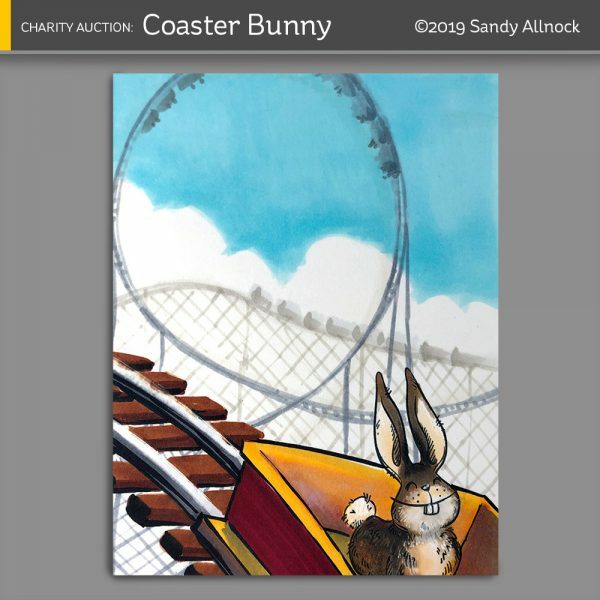 Harold read about the A-hop-alypse Coaster at the new Bunny Bay Amusement Park – and just had to buy a ticket! 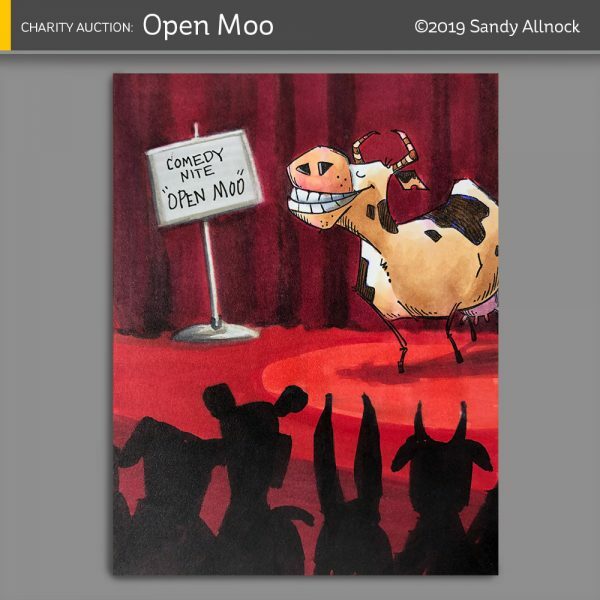 BID HERE. 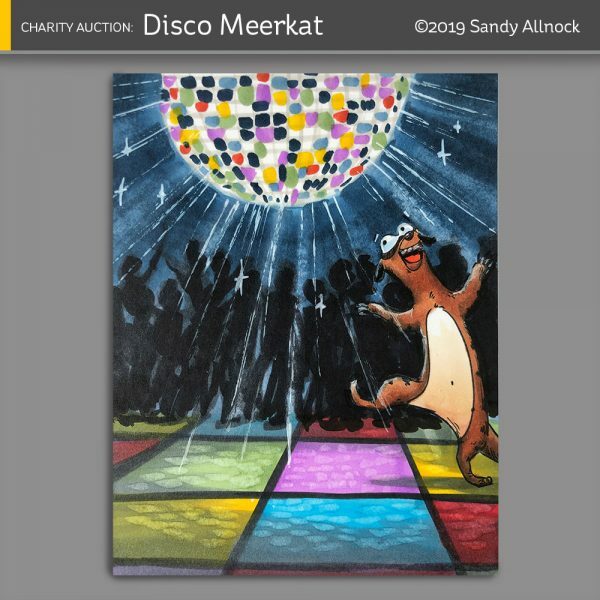 Olivia went wild on the dance floor when Deejay Meerkat’s played her fave song: “You Should Be Diggin’, Yeah!” BID HERE. Instead of videos on Wednesdays, I’ve posted some tips here on the blog each midweek – catch up on what you’ve missed HERE. 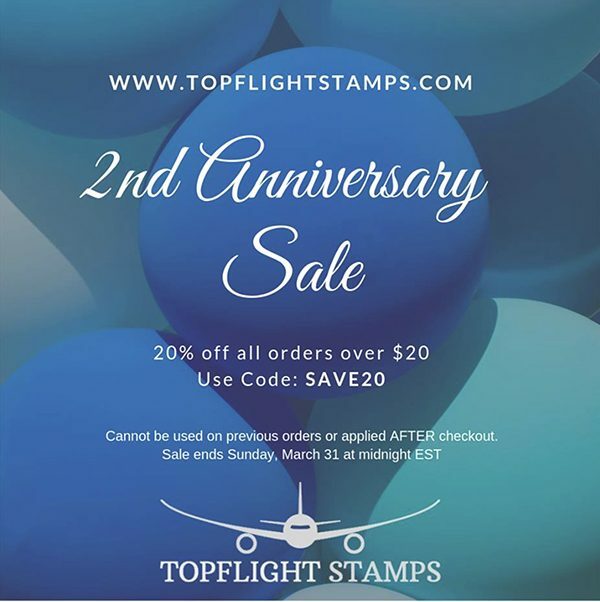 It is Topflight Stamps 2nd birthday! To celebrate, they’ve teamed up with some amazing crafters – please hop along with us all and show all of the crafters some love! Prizes: Topflight Stamps is giving one lucky winner a $50 Gift Certificate, and each stop on the hop has an additional $15 Gift Certificate up for grabs. To be in with a chance to win, make sure to visit every stop on the hop and leave a comment by April 8th. Winners will be announced on the Topflight Stamps blog on April 9th. Good Luck!